Guanabana tree (soursop); The tree of Annonaceae family growing from 8m high, with a straight trunk and smooth bark. The leaves are large, lanceolated, deep green on their outside, and whitish on their inside, and large covered by soft thorns. 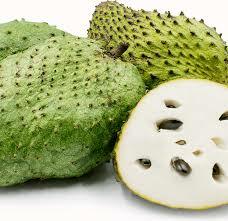 Guanabana fruit contains a whitish flesh with pleasant flavour, similar to that of the custard apple, though more acid. Guanabana fruit is highly valued because of its medicinal properties and as food. The flesh of the guanabana contains easily assimilated sugars, small amount of proteins and fats as well as vitamins B&C and mineral salts, especially potassium and phosphorous salts. It helps to ease the emptying of gall bladder, it has astringent, chlolagogue, digestive and also verimufuge properties. It helps people who are suffering from blood pressure, diabetes, obesity and heart disorders. The flowers of Guanabana are used as herbal tea in influenza and bronchial catarrh, because it has pectoral and febrifuge properties. 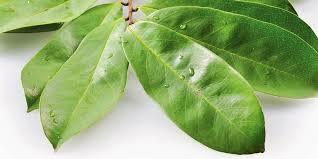 The leaves of Guanabana are used in infusion as antidiarrheic and digestive. When locally applied in the form of poultice, they have anti-inflammatory properties in the ease of mumps.